Every game day the streets would empty. A scurry of Lincolnites gathering booze and wings, Valentino’s or Runzas would end on cue, at kickoff. If you were entering town at this moment you could reasonably be led to believe the zombie apocalypse had arrived, until you drove by the stadium, which you undoubtedly would. This was college football, mind you, but that’s what we had in Nebraska and everyone loved it. After our religious denominations, we were Huskers first and foremost. Corn-fed, just like the quarterbacks. At least the good ones. My mother, sister and I would try to watch football games with my son-less father, who was stuck on a farm with three of us who didn’t give a hoot about sports unless they involved a horse or dog—then you could count us in. But not for football. In Nebraska, this was almost as bad as admitting you’re an atheist. So we kept a good front. Go team! Honestly though, we’d only watch if the Huskers made it to a championship game. Then we’d each grab a book and look up at the screen when we heard what sounded like “something happened.” Showing our support. I’d like to think my dad appreciated our efforts, although looking back, I’m sure we were just exhausting. People have tried explaining the game to me before. Countless times, my father included. And each time, I really do want to know, I just don’t want to store it in my brain. At some point in time I’ve known what a first down and pass interference meant, and the strategy of an onside kick and controversy of the tuck rule. At some point in time. Sure, you can blame this lack of interest on my gender. Stereotypes can be true. However, I know a number of intelligent women who love football—moreover, who seemingly understand it. Admittedly, I never know what to say to them and have a childlike inclination to poke them to see if they’re for real. And I’ve had well-meaning men and women explain to me makeup application, leg shaving, cutting coupons, and that I probably shouldn’t wear two types of plaid at the same time. However, I don’t manage any of these things very well. They’re too full of mystique. So there you go. It’s just me. And other women related to me, apparently. Perhaps it’s genetic. Most of the time during games we’d go on a bike ride or dog walk—something that involved being outside. Because it was nice, having no one else around. Some anglers stay tucked in, over-wintering like a garden with straw on top, busily tying flies and checking Google Earth for “lost streams.” Thus the number of anglers drops quite a bit during the cold months. However, the number of places those anglers can fish drops as well, and so you’re left with more crowded streams than you think. You’re left with one of those mathematical word problems about Bill and Jane and miles-per-hour and whether or not their cars will collide if they’re both driving uphill on a one-way street. Beneath a full moon. While it’s raining. Someone can figure this out, but not me. I’m the sort to make a vague guess about mileage (only have to fill up once every week and a half, which seems decent), how much cayenne to throw in the chili, and how much vodka goes into the mule. One of these latter two works out, either way. The other… you won’t get asked for the recipe and will be questioned, Where are the TUMS? But I got to thinking about those early days of feigning interest in football—something I didn’t and would never like—for my father, for boyfriends, for the ease it gives to small talk. It’s more socially acceptable to muster something about Manning’s touchdown record than start in on women in combat units or regulation of GMOs. And I thought that perhaps with professional teams, especially when said team is doing well that season, it could work in the same way it had for college—people watched. More importantly, they watched in gaggles, grouping like cavemen around fire. This is good. 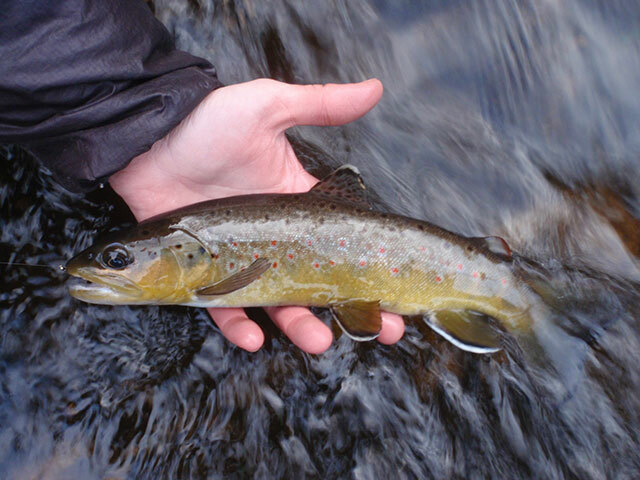 Fewer numbers of anglers on the same few winter-miles of water equals more room. That was my vague guess. And so on a Sunday afternoon I drove to the trailhead that led down to the creek I planned to fish. An hour before kickoff at 2:30 MST, the number of vehicles in the parking lot with No Pebble Mine and Patagonia stickers gave me pause; perhaps that rabid fandom I remember was only a result of parents paying tuition. They’d better win… I’m paying good money! But the anglers I encountered were all leaving, just in time for the drive back to the flatlands, out of the canyons… to radio reception and HDTV. To beer and wings, hollering and mascot flags clipped to the windows of hypermasculine pickups. And I kept walking downhill, out of the sunlight still grasping at the peaks. I stayed for trout and for the silence that somehow comes drenched in deafening water. Perhaps I’m not so bad at math word problems, after all.